Denis Guedj (right), pictured with Etiennette Auffray Hillemanns of the CMS collaboration and Hartmut Hillemanns of the DG-KTT group. French author Denis Guedj, who is also a mathematician and Professor of History of Science at Paris VIII University, visited CERN on 7 and 8 October. During a presentation in the CERN Library he discussed his 15 published books and likened the process of novel writing to working on a scientific experiment: it begins with a limited amount of data, and then questions arise, problems are solved and further research reveals truths. Denis Guedj works hard to ensure that his novels contain ‘true fiction’. His most recent visit to CERN will help him to write a new book set at the LHC in which he will combine his scientific interest in what happens when a proton and proton collide with a human story about what happens to a male and female physicist who meet in the LHC tunnel. 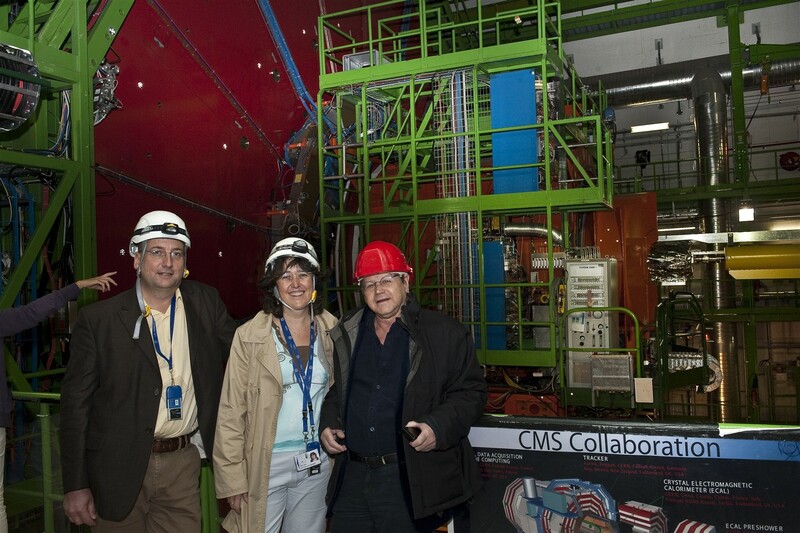 "Visiting the CMS cavern was like stepping into the world of my novel," he said at the end of the tour. "Questions arise when writing and I want to include the real truths about the LHC." The book ‘Collision’ will be published in early 2010. Guedj will soon return to CERN for the performance of his play on Monday 16 November, ‘One Zero Show’, in the Globe during CERN Science Week. The Bulletin will report on it in forthcoming issues.